Feeling Soaked At The Sink? Do you feel like you sometimes need to dress like this to use the sink? Okay. I know these photos seem a little extreme, but you get the picture. This is how you should feel every time you use the sink. You don’t need to get soaked using the sink. 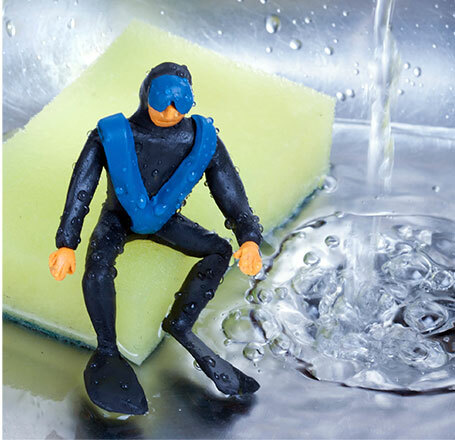 Protect yourself with the Splash Paddy® sink splash guard. It takes only a second to attach and you’re ready to go. Problem solved and you walk away feeling dry every time. Splash Paddy® is one of the few top rated sink splash guards of its kind on Amazon. You may not think you need a Splash Paddy®, but once you use it, you will wonder how you ever got along without one. It’s so nice to walk away feeling dry. We are revolutionizing the way the world does dishes. Original Classic Clear Splash Paddy®. This is the fold over model. It rolls over and stores in the sink when not in use so it is conveniently ready for the next time or it can be easily attached and/or removed in a second to store behind or under your sink. Click on the video link to see how it works.